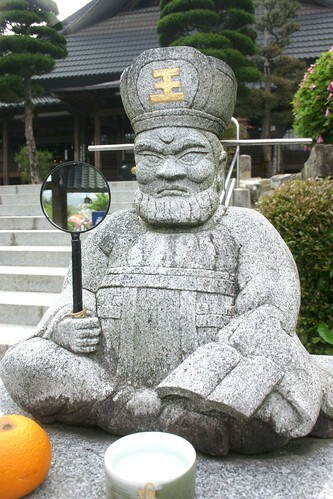 Another photograph of Daiou (big lord) with a reflection of the town in his mirror. There are offerings of a tangerine and some rice wine as you can see. These, like the mirror, have a strong Shinto influence if you ask me. But there is no heaven or hell in Shinto, AFAIK. This picture is very much in line with my theory of the Japanese self being "in the mirror."